Courtesy once again of Mr Ceranic, here are some concept sketches relating to two other key characters in the pilot script for the series, Town of Miracles. 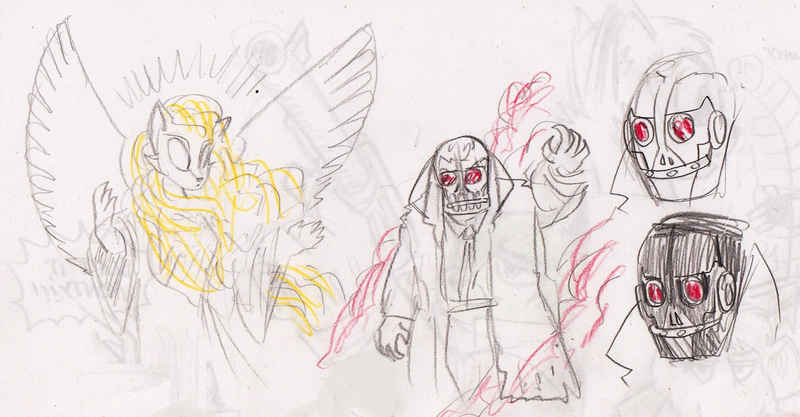 In Drawing A) we have the mysterious 'Angel' who performs the titular miracles, as well as somewhat inaccurate concept art of the episode's antagonist, 'The Plague Doctor', here as a more literal mad physician. This was down to a slight miscommunication in what he thought I meant by plague doctor. In Drawing B), now we have more fitting artwork of 'The Plague Doctor', here with a distinctly Burton/DelToro-esque spin on him.